If you decide to list your Leadville Colorado real estate with us, we want you to be aware of everything we do to market your property. It’s important to use both traditional and digital marketing methods. To maximize exposure, RE/MAX Aspen Leaf Realty subscribes to 3 different Multiple Listing Systems. This means that our listings go out to agents all over Colorado. In addition, they also syndicate to all major real estate listing websites. Below are a few more of the ways we’ll help get your property sold. This marketing advantage is unique to our office and gives us a hand up on the competition. We have a beautiful office (pictured above) right in the heart of downtown Leadville. Located on historic Harrison Avenue, our office sees a significant amount of pedestrian traffic and walk-ins. If you drive down Harrison on any given day of the week, chances are you’ll see people walking by our office checking out the listings in our window. When you choose to list with us, we’ll immediately begin marketing by placing an ad highlighting your property in our window. It’s a powerful marketing advantage that only our office can give you! Yep, print marketing is still standing up strong in this digital age. Sure, maybe print ads aren’t considered cutting-edge anymore, but they’re still effective — and they just might be the extra publicity your property needs. For example, we advertise in the local newspaper and other print media sources around town. We also take out ads in regional magazines and place flyers onsite at our listings’ locations. 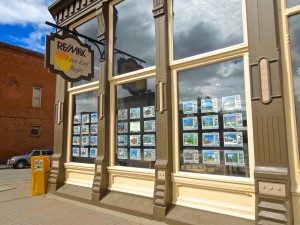 Digital channels are essential for marketing your Leadville Colorado real estate. All of our listings appear on nearly every major real estate listing website out there. Zillow, Trulia, Realtor.com, Homes.com, remax.com and other sites will all show your listing in addition to being posted here on LeadvilleHomes.com. An informed seller is a profitable seller! Sign up for email updates on other listings in the area to see what the market is doing, and to help you make the most informed decisions possible. You can set up email updates by visiting our Listings page and creating a saved search. Many homeowners don’t know what staging is or how valuable it is when selling a house. Our team will work with you to make sure everything is perfect when we start showing your home to buyers. It’s important to have your home looking warm and welcoming! Photos are crucial — they catch the eye and tell a story, and they do it a lot faster than words. Many property photos are awful; in fact, there are several websites devoted to showcasing bad real estate photography. We’re proud to say we’ve never been on those sites! Our team will make sure to get great photos that really show off the beauty of your Leadville Colorado real estate in a way that catches the eye of your perfect buyer. Virtual tours are a relatively new trend in real estate marketing. You can have the best photos in the world for your property, but adding a video really gives potential buyers a better feel for the place. We currently make it a priority to add a video for our listings using Zillow’s Video Walkthrough feature.